You’ve probably heard that walking under a ladder is bad luck. You don’t need to believe in superstition to draw upon good common sense when using a ladder. The American Ladder Institute (yes, there is an American Ladder Institute) offers these guidelines for safe ladder use, which are especially appropriate this time of year when putting up holiday decorations. Heightened Awareness. If you feel tired or dizzy, or if you’re prone to losing your balance, stay off a ladder. If you’re not cautious, you may find yourself on the ground or even taking a trip to the hospital. How’s the Weather Up There? If storms or high winds are in the forecast, wait until they pass. You may lose your balance when standing on a ladder in high winds, and wet weather can make your ladder slippery. It takes just a couple minutes to check the weather, so take that step. Soles, Man. Wear clean, slip-resistant shoes. Shoes with leather soles are not appropriate for ladder use since they are not considered sufficiently slip resistant. While you may think it’s a hassle to change shoes, just think of the alternative! Know Your Ladder. Before using your ladder, inspect it to make sure it’s in good working condition. If it has loose or missing parts, or if it sways or leans to the side, it’s time to get a new ladder. The Right Tool for the Job. The ladder you use must be the right size for the job. The Duty Rating (the maximum weight capacity the ladder can safely carry) must be greater than the total weight of the climber, tools, supplies and other objects placed on the ladder. If you need a ladder with a higher rating, now’s the time to purchase one. And you’ll be surprised how many times this second ladder will come in handy in the future. Rangefinder. Your ladder must be tall enough so you don’t have to stand on the top rung or step. Standing that high is extremely dangerous and can cause the ladder, and you, to become unstable. Once again, if you need a taller ladder, borrow or buy one. Balancing Act. When your ladder is being set up for use, it must be placed on firm, level ground. If you’re working by a door that can open toward the ladder, the door must be blocked open, locked or guarded. You can imagine what would happen if you don’t take one of these steps. It’s all about prevention. Using a ladder properly will help you get a rung up on safety and prevent mishaps. 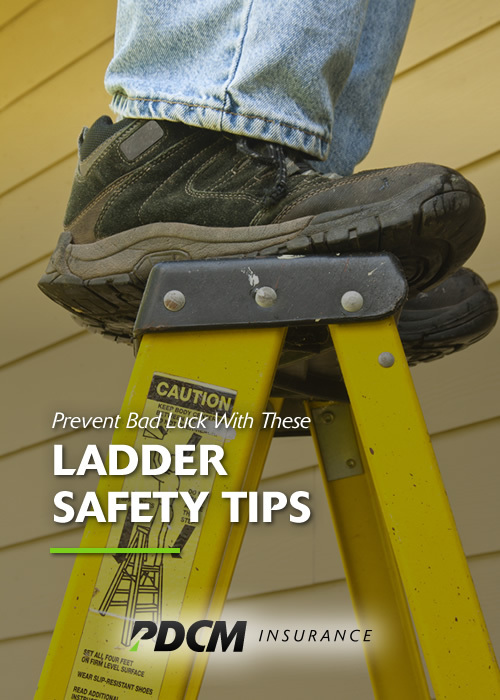 What tips might you have about ladder safety? Experience is the best teacher, so let us learn from you! December 8, 2015 in Insurance News.